Announced during the finals of Hong Kong’s E-sports Festival, Capcom have revealed that Menat is the fifth character coming in Street Fighter V’s second season. A fortune teller by trade, Menat actually uses her crystal ball to beat her opponents senseless. Test your might with our list of the PC’s best multiplayer games. 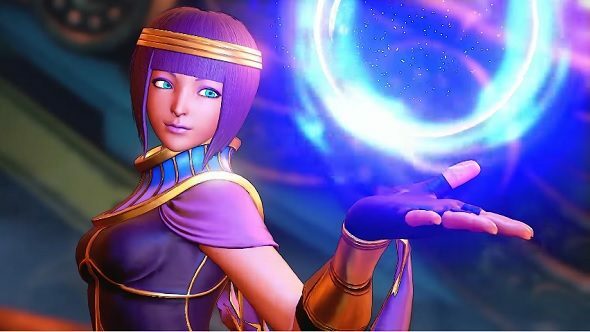 First appearing in a Story Mode cutscene for fellow DLC character Ed, Menat is the apprentice of fortune teller and Street Fighter veteran Rose. Her fighting style is remiscient of her teacher’s, with Menat having a projectile reflect move and a V-Trigger that looks similar to Rose’s Soul Satellite. Rather than just two energy orbs, Menat summons six energy orbs which orbit around her and can be fired at will. Combined with her crystal ball, that’s seven projectiles you have to worry about at once. Menat uses her crystal ball as an extension of herself, using it to increase the range of her punches and kicks. She can also place the crystal ball at certain heights behind her foe, allowing Menat to bounce enemies between her and the ball. Successfully blocking Menat’s attacks is going to be a nightmare. Fighting game fans will notice that Menat plays a lot like Viola from Soul Calibur V, who also uses a magical crystal ball to bamboozle her opponents. When you also factor in that Menat has a Dhalsim-esque dive kick and a teleport – you’ve got a zoner’s dream character. You won’t have long to wait to play Menat either, as she joins the Street Fighter V roster on August 29th. As with all Season 2 characters, Menat also comes with a Story and Battle costume. Her Story costume has her wearing a hooded purple cloak, while her Battle costume has her dressed in nothing but a headdress and mummy wrappings. That’s one outfit that definitely won’t be appearing on ESPN any time soon. If Menat is looking like your kind of character, you can purchase her as part of the Season 2 Character Pass, which costs $29.99/ £24.99. Otherwise, she can be bought with Fight Money, Street Fighter V’s in-game currency.